One of the significant aspect of Sikhism is its group consciousness and its belief in the presence of the Guru in Sangat. Literally, Sangat means assembly of people who work or assemble together for social, moral or spiritual well being of the community. It is a company of like minded saintly people which purifies and uplifts the devotees. Bhai Gurdas writes in Var 13-Pauri 19 that where there is one, he is called Sikh, where there are two, they are called Sadh Sangat and where there are five, God manifests in them. It is assembly of holymen in the presence of Sri Guru Granth Sahib where nothing but the Name of One God alone is recited. It is an assembly, where there are discourses of truthful people on the name of God. It is the company of saintly people who have an ennobling influence on the human mind. Whenever persons of truthful living assemble, they constitute Sat Sangat. Remembering of Name in the company of saints is given significant place in Sikhism. Guru Nanak Dev laid foundation of saintly assemblies when he visited different places to propagate Sikh philosophy. Just as the fire destroys the cold, similarly the company of saints vanishes the sins. Sat Sangat is considered most important in the Sikh way of life. It is given special status among the Sikhs. Every Sikh is expected to attend Sangat in the Gurdwara where all devotees sit together on the carpeted floor irrespective of their social, political, economical or religious position. This implies equality. They recite or listen to the praises of God. They learn from each other and in good company they shed off their amoral tendencies. It is strongly believed that the Guru is physically present where there is an assembly of five holy persons. The Sangat consists of minimum five Sikhs in whose lives the Sikh religion is transfigured. It is said that where there is one Sikh, there is one Sikh. Where there are two Sikhs, there is an assembly of saints. Where there are five Sikhs, there is God. Sangat is the training school where the devotees practice discipline of the Guru and acquire virtuous qualities. ( Var Kanra M-4, 1316 ) In addition to the ripening of the spiritual thought, Sangat creates social and organizational awareness also. Sangat helps in harmonizing the people who live in disunity and have diversity of faith. It serves as a link between common people and the Guru. Normally the congregation takes place at Gurdwara ( Sikh Temple ) in the presence of Sri Guru Granth Sahib. The devotees sing hymns from Guru Granth Sahib, recite Name of God and pray for universal peace and prosperity. The singing of Gurbani is called Kirtan. By listening and devotedly reciting the holy hymns one is inspired to put the precious teachings of Bani into actual practice in life. In the company of such saints, one realizes Truth. His sins are washed away and he wins the grace of God ( 809 ). How one can get company of Sangat ? Man is known by the company he keeps. Man is the result of environment. Company is a great force and it plays a big role in shaping a person. Those who live in the company of thieves, robbers and evil persons, acquire evil ways of life. Those who keep the company of saintly persons are shaped in the saintly mold. There may be people who live near good and saintly persons but they are so much over involved in their ego that they do not think of becoming good people. “Do not follow the example of Bamboo which is drowned in its ego. Sikhism lays emphasis on leaving the bad company, as it ruins the mortal. Sagal Purkh mein Purkh Pardhan, Sadh sang jaka mitte Abhiman. In all the Gurdwaras, there is almost daily assembly where people gather, meditate and sing hymns in praise of God. Their sins are washed and they follow the path of truth. The Sikhs present a good example of selfless service and sacrifice in all the Sikh Gurdwaras. They volunteer their time in Community kitchen. They acquire humility, contentment, detachment from the worldly illusions, temperance and true faith in God. The Sikh Gurus laid great emphasis on attending the holy assembly. The congregation influences the personality and character of the devotees. Sat Sangat produces visual Divine harmony and internal bliss. It helps in the attainment of Truth but it becomes available with the blessing of God. The society of the truthful is not available without good fortune and His Grace. Sandal tree has fragrance. It distributes its fragrance to those who are near it, irrespective of their growth..The Simal tree becomes fragrant in the neighborhood of the Sandal tree. A devotee who remains in the company of holy persons and attends Sangat, relishes the fragrance of Gurbani and Kirtan without knowing the change. Guru is present in the company of the holy persons. Guru is ever present in the holy congregations in Gurdwaras and other private and public assemblies where Guru Granth Sahib is present. 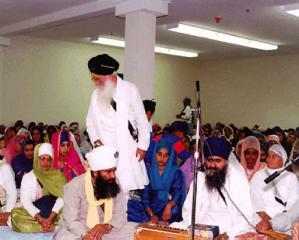 Attending the Sadh Sangat is regarded as coming in to the presence of the Guru. According to Bhai Gurdas, a Sikh who remains in the association of the Guru is blessed and benefited. Light which manifested in the ten Gurus continues to manifest in the Sangat and the Khalsa. The Society of the good or Sadh Sangat gives birth to modesty, patience, tolerance, service, righteousness, simplicity, conscienceness, truth, love, justice, friendliness, mercy and contentment. 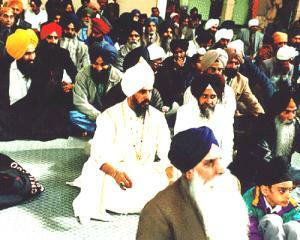 Bhai Gurdas declared that the spiritual goal could be achieved through Sangat and Nam simran. Sri Guru Granth Sahib pages 271-72.